Because I love bothering elected officials almost as much as I love riding my bike, here’s a quick action item for South Carolina residents: tell the state to allocate Alternative Transit money to actual Alternative Transit projects! Apparently 50% of the budget gets moved over to highways every year, which is an absolute shame when you think how far the dollars can go on biking and walking infrastructure than on car-centered projects. I also like this study that shows how roads with protected bike lanes actually save money for both individuals and economies. 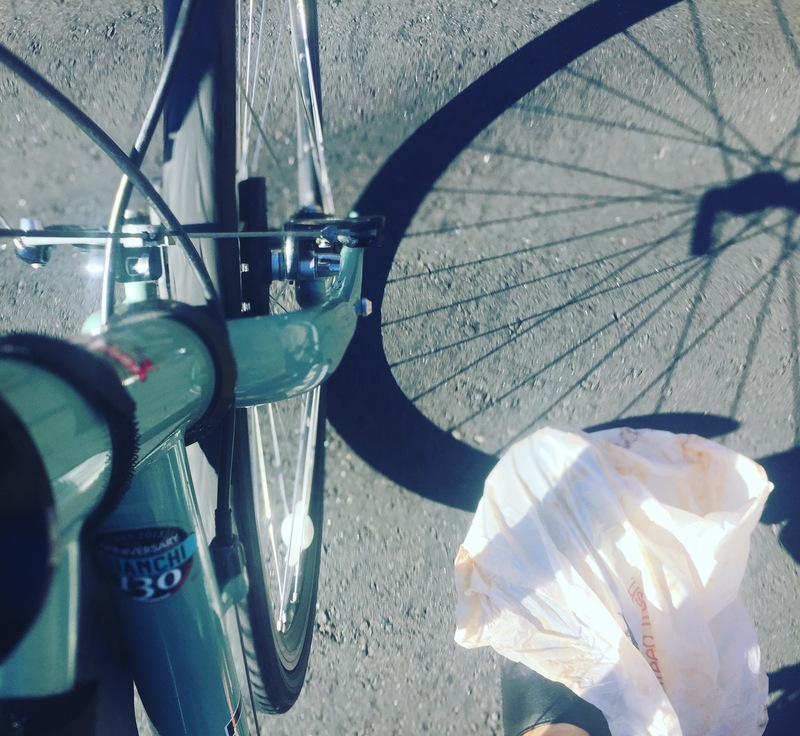 Catching a stray plastic bag (on purpose) with your foot as it flies across your path at just the right moment.. to me at least, is super satisfying. Catching a plastic bag on your foot: kinda gross. A world full of plastic trash on the ground and in our waterways: way grosser. 1. After trying to install knobby tires to my bike and failing miserably, I rode to my local bike shop and practiced changing tires for 2 hours under supervision (by the way I’m beyond lucky to live just a mile from this shop, it’s simply the best place in Greenville). 2. On a day I might usually not leave the house and the high was 30 degrees, I went to a local community event in Greenville to protest against the current anti-immigration, negative political climate that is detrimental to our beautiful and diverse country. There were local speakers who shared their experiences and it was incredibly moving, not to mention informative. To be honest, if I hadn’t had to ride I might have just stayed home and made some excuse. But I am so glad that I went. 3. Since I work for the school district, the night before a potential snow day there’s a 5-6pm witching hour of OMG WHEN ARE THEY GOING TO ANNOUNCE THEIR DECISION where I sit and hit “refresh” repeatedly until the announcement posts and I can move on with my life. However, I had spent the day inside on the phone planning my Natchez trace trip (or trying to), and knew I had to get my ride in before it got dark and temps dropped again. So I went for a quick spin around my neighborhood, took my compost out to our community garden, and had a serious moment of zen. The air was so crisp, the sunset was gorgeous, no one was out and I meandered some neighborhood streets I hadn’t bothered exploring before despite living in my current apartment almost 2 years. Then I got back home, found out we had another snow day, and pouted because I actually want to go to work (also I need those makeup snow days for aforementioned Natchez Trace trip). But sometimes you just have to roll with it. 4. On yet another day I might be tempted to stay home and be a total cat lady (teacher work days, I went to too many faculty meetings to NOT use my saved up hours, k? ), I reconnected over coffee with a friend at a place I’ve been stalking on instagram for like a year now. Check and check. 5. On MLK Day, a local bike club hosted a civil rights history bike tour of Greenville. I learned so much about my little town that I’ve come to love so much. We saw and discussed examples of segregation in daily life, sites of protests and marches, reminders of tragedies and failures of the justice system such as this one, and buildings where leaders such as MLK, Jackie Robinson and Jesse Jackson once stood, spoke and lived. Greenville gets a lot of recognition for being a forward thinking small town, but it’s important to remember that it wasn’t always this way. As painful as it is to hear these stories of discrimination and prejudice, we need to realize that we’ve come a long way, and we have a long way to go. Try something that scares you. Pursue something that fuels you. But be warned, you probably will never want to go back. A person who commits the above offense is guilty of a misdemeanor and, upon conviction, must be fined not less than two hundred fifty dollars or imprisoned not more than thirty days, or both. (1) Riding in other than designated areas. Ride a bicycle other than on a paved vehicular road, street or path designated for that purpose. Phrased alternatively, do not yell at a bicyclist to “get off the road”, “use the $%&@! sidewalk”, swerve toward them aggressively, etc. We are road users. We are sisters, brothers, mothers, fathers, offspring, teachers, students, business owners, neighbors, friends and spouses, and we’re taxpayers (don’t even start with me on that one). We’re fellow humans doing something different than you, not to be confused with your Mortal Enemy or someone you need to lecture. We’re not going anywhere, and we’re not going to stop asking you: please be nice, and just try not to kill us. That’s literally all we’re asking of you. Still too many words? DBAA. Also, I’m getting really good at memorizing license plates. Because I do group rides with crazy people, we’re trying for 365 days of riding this year in 2017. Log at least 1 mile a day on Strava and be the last one standing for ultimate bragging rights (maybe by next year we’ll have worked out real prizes). And if you haven’t ridden yet today, you have just under 3 hours (EST) to join us!